Show Low is a city in south eastern Navajo County. It lies on the Mogollon Rim at an elevation of 6,300+ feet, 175 miles northeast of Phoenix and 195 miles north of Tucson. Show Low was established in 1870 and incorporated in 1953. The city sits in the largest stand of Ponderosa Pines in the United States and is surrounded by extensive forests with many types of trees and animals. Travel here is popular year round because of the vast area suitable for outdoor recreational activities such as hiking, biking, fishing, camping, skiing, horseback riding, atv use and golfing. Shopping is available at local unique shops and larger name department stores. Fast food restaurants as well as casual and fine cuisine available in many family owned establishments offer a wide variety of dining choices. According to the 2010 Census Bureau the population in Show Low was estimated at 11,763. Winters bring highs between 45°F (7°C) and 55°F (13°C), with lows usually below freezing between November and March, averaging in the 20s December through February, and in the low 30s for November and March. In the summer, highs average around the 80s°F, with an occasional day above 90°F (32°C) not uncommon for the city in more recent years and has twice reached 100°F + record high temperatures in May 1969, and again in July 2003. As the sun sets in the summertime, temperatures can drop dramatically, sometimes upwards of 30 degrees. This nightly temperature swing results in summertime lows typically ranging between the mid 50s to the 70s. Show Low has reached below-freezing temperatures every month at least once in its recorded history except in July and August, where temperatures have only reportedly reached 38°F (3°C) and 37°F (3°C). The record low temperature of -25°F (-32°C) was set on January 8, 1971 and has approached closely most recently again New Years Eve night 2010 at -19°F. Show Low averages about 18 inches of rain/snow per year. Show Low Regional Airport provides passenger airline service through Great Lakes Airlines to Phoenix maintaining a single passenger terminal for this purpose. The airport is also commonly used for air cargo, air-taxi and as a fixed base operator for general aviation. The city also maintains a minor public transportation operation traveling from Show Low to Pinetop-Lakeside. Shuttle service has drop off or pick up areas at multiple retail stores, government offices, the airport and nearby Hon-Dah casino. Almost all of the city is a part of the Show Low Unified School District. A portion of the city is within the boundaries of the Blue Ridge Unified School District located in Lakeside. Schools included in the district are Linden Elementary, Nikolaus Homestead Elementary, Whipple Ranch Elementary, White Mountain Institute, Show Low Junior High School and Show Low High School. Home of the Cougars. Conveniently located off the main street, White Mountain Campus is home to 1 of the 4 regional campuses of NPC or Northland Pioneer College. Fish stocked lakes open to the public include Show Low Lake and Fools Hollow Lake and are equipped with boat ramps, camp sites and covered ramadas. White Mountain Lake is a private lake accessible to residents of the community. Broad range of community facilities including a newly constructed municipal library, bowling alley, an archery range, a multi-screen movie theater, senior center, parks including dog parks, softball feilds, play grounds, tennis courts, indoor racket ball, volley ball, disc golf, basket ball, hand ball, walking trails, fitness stations, covered ramada/pavillion facilities, picnic areas and an indoor aquatic center with heated pool and spa. Summit Healthcare Regional Medical Center is the multiple story, state of the art Hospital with 89 licensed beds, emergency room, ambulance and helicopter transport, offering a wide variety of specialty physicians and out patient services. StatClinix Urgent Care is the walk in clinic open 7 days a week. According to story, the city was named after a marathon poker game between C.E. Cooley and Marion Clark. The two men decided there was not enough room for both of them in the settlement. The two men agreed to let a game of cards decide who was to move. 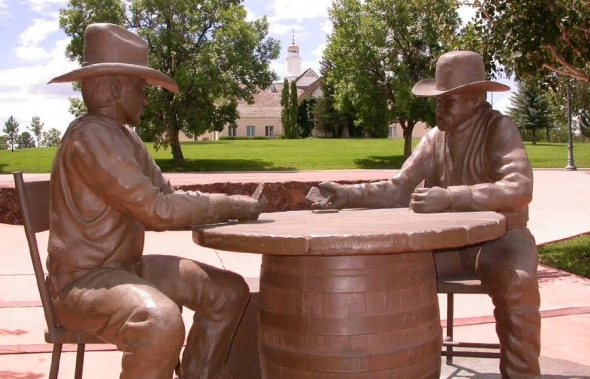 According to the tale, Clark said, “If you can show low, you win.” Cooley turned up the deuce of clubs (the lowest possible card) and replied, “Show Low it is.” The stakes were a 100,000-acre ranch. Show Low’s main street (Highway 60) is named “Deuce of Clubs” in remembrance. There are several active golf courses within a 35-mile radius, in city limits there is Show Low Country Club/Bison open to the public and Torreon Golf Club that has 2 18 hole courses and a 9 hole children’s. Torreons course is private and located in their gated community. Pinetop Country Club has a private course. Pinetop Lakes Golf & Country Club has a semi-private course open to the public. White Mountain Summer Homes/White Mountain Country Club Golf Course. Silver Creek Golf Club in the White Mountain Lakes community. Snowflake Municipal Golf Course. Concho Valley Golf Club. Pine Meadows Country Club in Overgaard. In 2002, the states 2nd largest forest fire the Rodeo-Chediski wildfire, threatened the city and neighboring communities and forced an evacuation burning over 400,000 acres of woodland and destroying over 400 homes and costing more than $40 million. The man started wildfire was initially 2 separate fires the 1st named Rodeo beganburning on June 18, 2002 on the Fort Apache Indian Reservation. The Chediski Fire was 2nd and was reported on the morning of June 20 near Chediski Peak northwest of Cibecue. The 2 fires joined June 23rd and was not declared controlled until July 7. The President declared a State of Emergency and traveled to Springerville/Eager a city about 45 miles east in Apache County where most of the evacuees were staying in the Round Valley High School sports dome. It was the worst forest fire in Arizona’s recorded history until June 14th, 2011 when the accidental man started Wallow Fire surpassed Rodeo-Chediski. Named after the Bear Wallow Wilderness area where the fire originated near Alpine a small popular tourist town known for its quiet secluded resorts in the tall pines. The Wallow Fire continued over state lines into New Mexico burning over 500,000 acres and was not declared 100 percent contained until 6 p.m., Friday, July 8, 2011. Show Low offers many public places as well as private clubs. American Legion, Lions Club, The VFW Post (Veterans of Foreign Wars), The Elks Lodge and The Moose Lodge. Churches including Baptist, Catholic, Christian, Methodist, Latter-Day Saints, Jehovah’s Witnesses, Lutheran, Non-Denominational, Presbyterian, Seventh-Day Adventist and a few more. Sunrise Park Resort is Arizona’s premier ski destination only approximately 40 miles from Show Low. In winter the 3 mountains offer 65 runs sure to land adventure for skiers of any level. There is also a separate snowboarding area, cross country ski trails, tubing, sleigh rides and a special children’s “ski-wee” area. Sunrise has all year round outdoor activities such as hiking, mountain biking, disc golf, horseback riding, camping, fishing and scenic lift rides. Hon Dah Casino Resort & Conference Center is about 15 miles from Show Low offering lodging, dining, RV park, live entertainment, slots, blackjack and poker.